"the three important areas where advances are noticed the world over are biotechnology, energy and information technology ( it ). When the rural people can use one component of it , which is television, why not the other? The benefit of it is immense to poor, rural families," says V Balaji, regional coordinator, Asian Ecotechnology Network, M S Swaminathan Research Foundation, Chennai. To find out the extent of the benefit people can derive from it , the foundation has launched the Knowledge System for Sustainable Food Security programme in a few villages near Pondicherry. The objective of the project is to access the impact of information and communication technologies in fostering a transition to sustainable agricultural and rural development and to document their role in promoting the process of "knowledge empowerment" of rural folks. To begin with, the Swaminathan Foundation selected five villages - Villianur, Keezhur, Embalam, Veerampatinam and Pillayarkuppam - for the experiment. 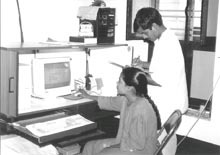 In the first phase of the project, during September-December 1998, information centres (called shops) were set up in Keezhur, Embalam and Veerampatinam. In each village, several meetings were held with various groups of people to select volunteers to operate the shop. In each shop, a Pentium pc with multimedia and a deskjet printer has been installed in a specially-designed box to prevent rodent attacks on the instruments. The pc can be connected to the wireless network through a modem and interface. Each shop also has a board to display bulletins received on emails from value addition centres. In Keezhur village, the people decided to give both men and women the opportunity to run the information shop. The present volunteers, comprising a male and a female member of the chosen family, have set aside a portion of their house for the shop. Both have 10 years of schooling and have been given basic training on how to operate the pc , including email. All the volunteers in Embalam are women in the 21 to 27 age group. Each one of them take turns to operate the system. The shop is located on the premises of the village temple. In addition to email bulletins, the shop receives RealAudio files, which facilitate the system's use by illiterate women. Veerampatinam is a coastal village with a large population, of which 98 per cent of the families are fisherfolk. The village panchayat has allotted space for the shop in its own office. Three volunteers have been trained to handle the pc. The centre also received data on fish aggregation off the coast of Tamil Nadu and Pondicherry. The information shops are open on all working days from 9 am to 6 pm. Fifty per cent of the users in Embalam are women, while the proportion is less than 20 per cent in other villages. At a meeting, it was learned that women suffering from infections or reproductive problems preferred information shops as the best way to learn about preventive measures. The research foundation also found that provision of dynamic information on prices and availability of seeds, fertilisers or pesticides was considered important by all farmers. Knowledge of foodgrain sale prices in various markets in and around Pondicherry is also vital for farmers during the harvest season. The agricultural labourers, mostly women, who are partly paid in kind, that is foodgrains, are eager to know about the sale prices. They also emphasised the need for information on alternative sources of income, such as making incense sticks. Now, there is an agreement that the centres should provide all information on public schemes for rural welfare and the government's list of families living below the poverty line. The value addition centre, which has been set up at Villianur village, has already supplied the farmers with a few answers such as entitlements to rural families and grain prices in Pondicherry region. Recently, the villages took a significant step forward with the commissioning of solar hybrid power systems. This is the first time that such systems have been installed in the country. Bharat Electronics Ltd and Swaminathan Foundation are jointly involved in monitoring the working of these devices, which provide back up power for the pc with a wireless transceiver and printer for up to five hours.